T-Shirt Trifecta has 3 unique t-shirts to enhance your wardrobe. View 1 is sewn by the serger with the seams to the outside for an interesting designer detail. 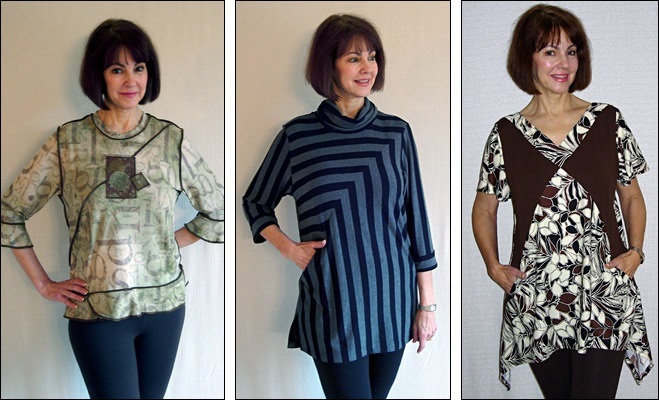 View 2 is a tunic length t-shirt with side slits and a zipper pocket in the diagonal seam. It has a turned collar and facing on the 3/4 length sleeves which turn to the outside. Made from a stripe or solid, it will be a wardrobe favorite. View 3 is a comfortable tunic length t-shirt with seams which form points at the sides for a flatterning slim look. Any sleeve or neckband and collar can be interchangeable.